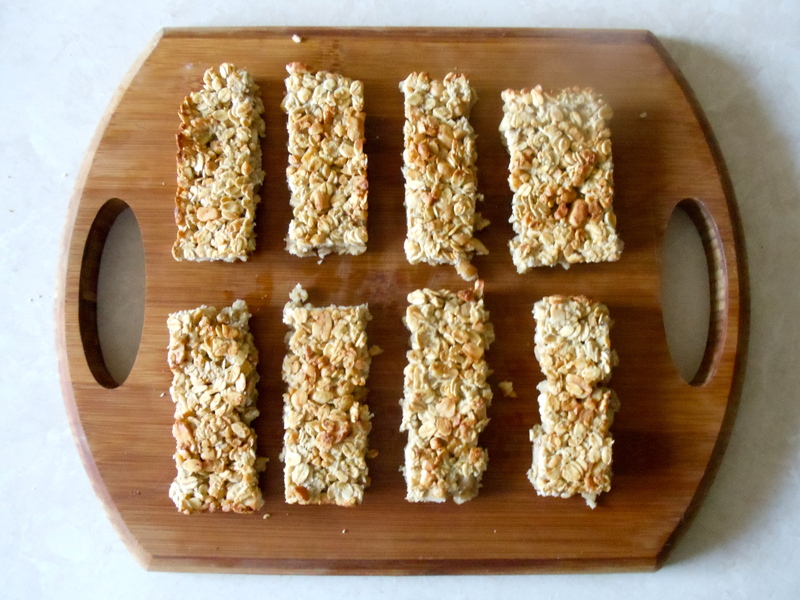 I’ve been experimenting with muesli bars for some time. And there have been some disastrous results along the way. In the past I’ve had trouble getting them to stay together when cut up. I even tried doubling the honey in one recipe, which only resulted in a sickly sweet batch of muesli crumble. Yuck! Recipes also tend to make a huge dish that lasts me way too long, especially if it doesn’t turn out great. Inspired by my last couple of posts, I have only used one source of sweetness for this recipe in the form of honey. The peanuts also add their own distinct flavour to the mix, as well as some protein – perfect fuel for beating the mid afternoon slump! I have opted for an egg to bind it all together rather than any glucose or syrups. It does the job perfectly, and I promise it won’t fall apart when you go to chop the bars up. This recipe makes 10 bars, which is perfect for me because it won’t last for ages and I can try something different in a few days. And its really simple to make! Just combine your four ingredients in a mixing bowl, press the mixture onto a baking tray and bake! Preheat oven to 180 degrees celcius. Line a small baking tray with paper. Place peanuts in a plastic snap lock bag. To crush, hammer with a meat tenderiser (meat mallet). Combine all ingredients together in a large mixing bowl. Bake in oven for 15 minutes or until mixture is golden. Take baking dish out of oven. Cool. Chop muesli bars into 10 pieces and store in an airtight container. Sounds good, will have to try it. My only concern is carbs content and the fact that most of the carbs are coming from the honey (simple sugar). Hi Anna I tried making this recipe using purée apple and banana to sweeten it instead of the honey, but it did not taste great and I couldn’t post it. Other muesli bar recipes also tend to include ingredients like brown sugar, dried fruit and syrups which I haven’t. And the honey in this recipe (1/4 cup) is only a small portion of the total ingredients (2.5 cups). I,the picky eater think it sounds good, but no oven to bake them in.